You are currently browsing the Christian Heilmann blog archives for May, 2011. I am a lucky, lucky man. I do the job I love and I do it from where I live. Well, technically – with my travel schedule I mostly do it from hotel rooms, airport lounges, trains and coffee shops. In any case though, I am lucky. My company supports and pays people who do not work in an office with everybody else. Even more astounding – my whole team does this: six people in six time zones. At a meeting we all had we discussed that phenomenon a bit and my boss gave a quick internal lighting talk on the subject of working remotely. We also had quite a few conversations about this when we had our 1:1 meetings and I want to share a few of the observations we both had. More output – I find myself constantly feeling guilty of not doing enough (and that is a common feeling). Being visible in an office and available for quick meetings gives you a false comfort of having achieved something. You might not have – you have just been busy. If all people see is what you produced (this could be code, documentation, emails or whatever else) you concentrate much more on the production rather than the talk about it. True, this might mean that things get written that are not 100% what is needed, but at least things get done. More documentation – as everybody is distributed and not on the same time zone it becomes much more important to document what you do. This leaves a trail of what has been done before that can be used to hand over work to others if a person gets sick or leaves the company. Efficient use of communication tools – instead of meeting in a room at a certain time or impromptu the channels of communication of the web become much more important to have a quick chat. 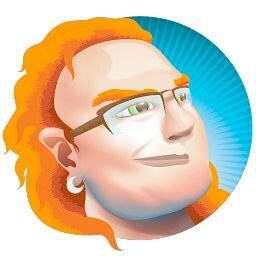 In Mozilla we use Skype, IRC, various messengers, phones and video chat. Again, as we are relying on these for information and communication we use them more sensibly than you normally would. Your status on a messenger is a very important tool to tell your colleagues what is going on and avoid them asking for help and not hearing anything for hours. Messaging evolves from a distraction into a lifeline. Collaborative writing – we tend to use Etherpad before and during our meetings to take care of deliveries, goals and actions. By having everyone edit at the same time you collect an amazing amount of information quickly without having a single “meeting note taker” and then hope people will read it. When you were part of the process you are much more likely to read up later on. Sequential production – being in different time zones means you can work on the same product in sequence. I can write a text in London in my morning and send it on to my colleagues for review in the afternoon. They can hand it on to another person to add more content and I can finally review it the morning after and put it live. By the time the whole of Europe has tweeted, talked and commented on it the US uptake will be much higher because the content already comes with better reputation. Independence and trust – when you are not sitting next to another you are much more empowered to work on your own terms. This can be in a cafe, in your bed or on a train. As people can not look over your shoulder and constantly see what you are doing it breeds a culture of trust. You just expect your colleagues to do right as they are mostly reporting to their own peace of mind. Life is less disrupted – companies spend a lot of money on on-site restaurants, gyms and dry cleaning. All things to keep people locked in a golden cage and make their lives easier although they have these things at home. My favourite example is missing deliveries when I am in the office. Not every company delivers to addresses not connected to a credit card. So many a time I missed a “9 to 5” delivery of some product as I was at work and had to wait till the weekend until I had time to pick it up from the depot. Now I just work and get things delivered without me chasing after them. Jason Fried covered a few of these things in his “Why work doesn’t happen at work” talk and while a lot of it should be taken with a grain of salt, I for one am very happy with what I am doing right now. 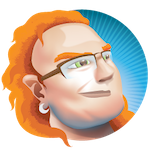 I was just lucky enough to pester Sean Martell – Lead Visual Designer (Reticulator of Splines), Mozilla to alter his Avatar to create one for me. Not many people used it, but it was cool to come back and to be able to dash off for a quick ride when I needed. Now yesterday this $99 second hand bicycle with broken breaks got stolen. I had locked it behind the Monte Carlo bar/nightclub thing on Castro Street in Mountain View and when I came back at 2am it was gone. 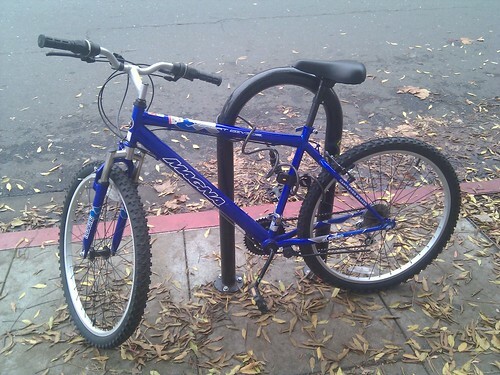 Now, if you are in the valley and you see the bike (it still has the goodwill stickers and $99 written on the handle bar) post a Tweet using #mozbike and cc me @codepo8 on it. If you see someone riding it – just cut in their lane as the breaks don’t work and justice shall be served that way. I just got back to my hotel after the merriments that were the Google I/O after party in the Thirsty Bear Brewery and thought it is time for some reflection on the event. Google IO was a very good conference, I heard a lot of interesting news, met people I hadn’t seen in quite a while and got to know a lot of others. It is a huge event and there was no lack of things to keep you occupied. Showcase booths of software but also an amazing amount or Robots and other hardware demos, vehicles to play with and lots of breakout space made it a great place to learn, look and talk to each other and people in Google. The HR presence was very subtle and there was no brutal hiring drive you get at other events of this nature. Catering was good, there was always coffee and drinks but the queues at lunch were very long indeed and I skipped a few meals to spend more time with folk instead. The main stage visuals were top-notch and the quality of the A/V equipment amazing. Talks were recorded, streamed and transcribed live. Great stuff. The wireless, on the other hand, was abysmal. This is partly the fault of the attendees who set up their own hotspots (despite the badge telling you explicitly not to do so) and thus saturating the wireless range. That there was no dedicated speaker lounge or network was an oversight I’d love to see rectified. I do enjoy tweeting and blogging about an event but couldn’t do so. The party on the first day had real time animations synced to the music by Sexyvisuals, lots of drinks and a truckload of cool things to look at. Hardware hacks, futuristic vehicles and a photobooth all kept people busy. The band was Jane’s Addiction and I can safely say they were totally out of place. Perry Farrell proved once again to be a d*ck by abusing Google and the audience on stage. All in all they just did not fit. This is a geek event. Why not get a geek band? This was money wasted. Overall the organisation was spot-on. You knew where to go, what is happening and there was not much congestion although the amount of attendees simply makes that happen. There was a glitch with my name tag showing me as a Google speaker and not external and thus not allowing me to get free stuff but it was remedied quickly enough. Talking of free stuff – people attending IO left laden with goodies. Originally I had hoped for Google to hand out new phones (as my Nexus One suffers from the known Off Button Failure) but going away with 3 T-Shirts, a mobile hotspot for the US (which saves me right now as the GBP 7.50 per MB of roaming is not fun), a Samsung Android tablet and the option to get my Chromebook as soon as they are out I really can’t complain. That doesn’t mean I didn’t hear people complaining! In addition to these “free for all” bits you also got extras for attending some special talks like an Experia phone at the gaming talk and a new Nexus S at the talk about Native Client. As I missed both this was not for me though. Drat. The conference started bad for me. I was asked to give a talk about HTML5 video and captioning/subtitling and was very chuffed about speaking at the great big Google event. It was tough for me to say no to two other conferences that had me listed as a speaker, and I still feel sorry about breaking my promise there. The blow came then when I arrived – as my talk got cancelled. So I was just to sit back, relax and enjoy the show instead of being a actor or part of the chorus line. I spent most of my time in the Chrome channel, so here is what I’ve seen with a quick one-liner about it. Most of these will be available as videos and the slides should be out somewhere, too. Chrome Web Store Publisher Forum – this sounded interesting but was not for me. If you want to publish something on the store and make money, there were some good tips though. Super Browser 2 Turbo HD Remix: Introduction to HTML5 Game Development – some great tips on how to build games. HTML5 Today with Google Chrome Frame – a good introduction on how to rid the web of the scourge of old IE - now also available for people who are not admin on their windows machine. Web Fonts are changing the Web. Learn why. – showcase of Google web fonts and the tools to easily use them. Some cool new features there. I thought the demo of creating a logo with a font was pointless though – why would I ever have to highlight and paste a logo? Creating Accessible Interactive Web Apps using HTML5 – well intentioned talk with great presentation but awful content. I will write a lot more about this one soon. Ignite I/O – always a great format and very cool talks this time. Google entering the open hardware arena with an own Arduino project that works with Android. Some very cool demos were shown about that and it is great for hackdays. Chromebooks coming out which are the grown up version of the CR48 pilot. I am not that excited for mom and dad end users but I see them as a great opportunity to get rid of old and outdated infrastructures in companies. Of course we need to get Office onto them somehow. A lot of cool file API and sound APIs for Chrome which hopefully should be coming in other browsers, too. Chromebooks coming with a built-in screen reader – you hear that Microsoft? Go ship NVDA with Windows! Well, for starters I can’t wait to get my hands on the Chrome book. I will also hunt down the HTML5 demos shown to get them fixed for other browsers and added to Mozilla Demo Lab and I will have a few talks with YouTube about captioning videos. And of course to have a good follow-up with all the people I met. Die Notizen kommen dann wenn ich mal Zeit habe, bis dahin schonmal viel Spass!